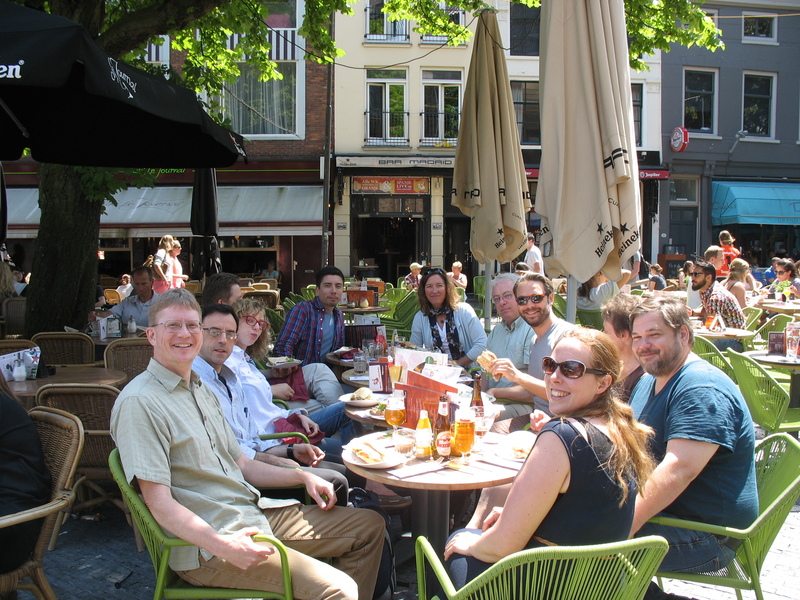 The initial plans for the North American Research Network in Historical Sociolinguistics (NARNiHS) were hatched by Mark Richard Lauersdorf, Fernando Tejedo-Herrero, and Rob Howell over beverages at a café in Utrecht in the Netherlands in the afterglow of the conference Mobility, variability and changing literacies in Modern Times (organized by Anita Auer and Mikko Laitinen). In the following months, Lauersdorf and Tejedo-Herrero were joined by Joe Salmons and Don Tuten to move the project forward to its first, organizational meetings and its official NARNiHS name (courtesy of Joe Salmons). 30 September – 2 October 2016. 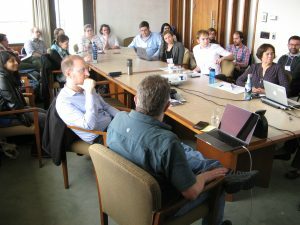 Twelve invited scholars along with students and faculty from UW-Madison participated in discussions of the need for a North American research network in historical sociolingustics (the “NARNiHS manifesto”) and the current state of the field. Ten-minute “lightning talks” by the invitees (Laurel Brinton, Josh Brown, Peter Grund, Rob Howell, Mark Lauersdorf, John Lipski, Felecia Lucht, Tom Purnell, Joe Salmons, Israel Sanz-Sánchez, Fernando Tejedo-Herrero, and Don Tuten) provided a snapshot of current work by North American scholars working in a range of areas in historical sociolinguistics. Additional time was devoted to planning and strategizing for the development of NARNiHS as an organization. See the Madison booklet. 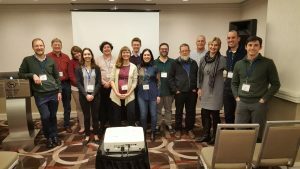 Nine invited scholars continued discussion of the development of NARNiHS, focusing specifically on the first public activities sponsored by the organization and scheduled to occur at the LSA 2017 Linguistic Institute. In addition, the participants (Joshua Bousquette, Al Byrnes, Ben Frey, Rob Howell, Robert Klosinski, Mark Lauersdorf, Paul Roberge, Joe Salmons, and Don Tuten) again shared snapshots of their research in historical sociolinguistics in a round of “lightning talks”. See the Emory booklet. 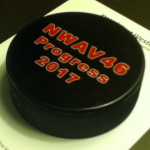 5 July – 1 August 2017. During the month-long Summer Institute of the Linguistic Society of America, NARNiHS sponsored a range of professional activities under the title “Historical Sociolinguistics Toolkit”, including a designated “course cluster” of Institute courses, a hands-on archival workshop, informal networking opportunities (details of the “Toolkit”), and the organization’s first formal professional conference (see next entry). Co-located with the LSA 2017 Linguistic Institute, the inaugural NARNiHS conference (organized by Lauersdorf, Salmons, Tejedo-Herrero, and Tuten along with Abbey Thomas and Kelly Wright) brought together an audience of 75-80 for the keynote presentation by Stephan Elspaß, and 30-35 participants for the full day of professional presentations the following day. The conference ended with an action-packed digital tools and methods workshop (led by Kelly Wright) and a successful poster session. 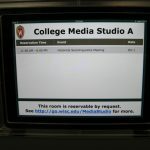 Conference website. 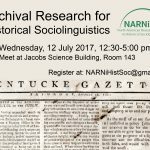 To promote NARNiHS across the professional sub-disciplines that historical sociolinguistics entails, a group of NARNiHS core members (Joshua Bousquette, Rob Howell, Mark Richard Lauersdorf) applied and were selected to present the workshop “Texts as data sources for historical sociolinguistics” at the 46th New Ways of Analyzing Variation conference. See the full NWAV 46 program, or here: NWAV 46 Booklet (Nov 3) . To provide a portion of “infrastructure” to ensure forward continuity of NARNiHS, the four organizing members (Lauersdorf, Salmons, Tejedo-Herrero, Tuten) formed the first NARNiHS Steering Group in late October – early November 2017, being joined on this initial Steering Group by Josh Brown, Alex D’Arcy, Israel Sanz-Sánchez, and Kelly Wright. The first official item of business attended to by the NARNiHS Steering Group was the establishment of Sister Society status with the Linguistic Society of America (LSA), officially finalized in January 2018. Sister Society affiliation with the LSA means, among other things, that NARNiHS will hold an “annual meeting” co-located with the LSA annual meeting every year in January – the 1st Annual Meeting of NARNiHS being held on 05 January 2019 in New York City. To increase its public profile, NARNiHS went live with its official website (a WordPress installation) at narnihs.org (the address you are currently visiting) on 01 June 2018. A Twitter presence, @NARNiHS, was added to the line-up of digital communication tools on 14 September 2018, with the first official NARNiHS tweet (no, not “Hello world!”) sent on 18 September 2018. These tools joined the NARNiHS listserv (NARNIHS@lsv.uky.edu) which, as the first communication channel connecting NARNiHS members, had been launched on 11 August 2017, shortly after the inaugural NARNiHS conference in July 2017 (see above). View of the Wasatch Mountains from the conference venue! 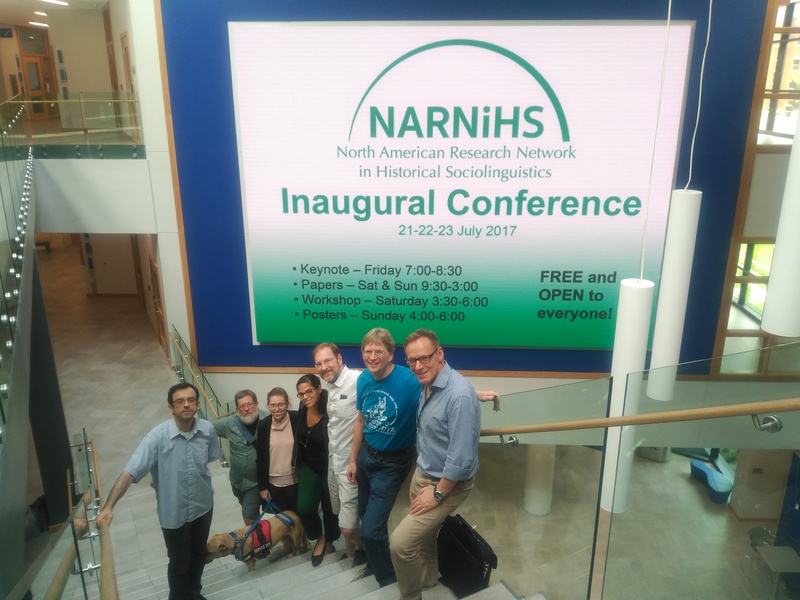 In an effort to build out the research network and increase the direct participation of members in NARNiHS-related activities, the NARNiHS Steering Group put in place guidelines for members to propose “NARNiHS-branded” talks, workshops, panels, etc. at professional venues beyond the NARNiHS Annual Meeting (LSA Sister Society) and NARNiHS @ the KFLC (see below). 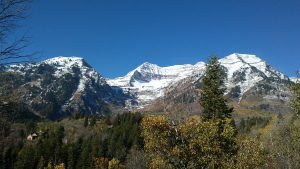 As an initial test of the possibilities of such “NARNiHS-branded” activities, several members coordinated NARNiHS participation in the annual conference of the Linguistics Association of the Southwest (LASSO), organized by Brigham Young University in Aspen Grove (Utah), 11-13 October 2018. High in the Wasatch Mountains, two NARNiHS-sponsored panels featured six presenters that discussed a variety of topics on language variation and change in the history of Spanish: Tania Avilés, Sonia Kania, Jeremy King, Covadonga Lamar, Israel Sanz, and Donald Tuten. This successful initiative provided a model for future NARNiHS-sponsored panels at other linguistics conferences. See the full LASSO program. In connection with the First Annual Meeting of the North American Research Network in Historical Sociolinguistics (see next entry below), the NARNiHS Steering Group sponsored the first open meeting for NARNiHS members and interested parties. 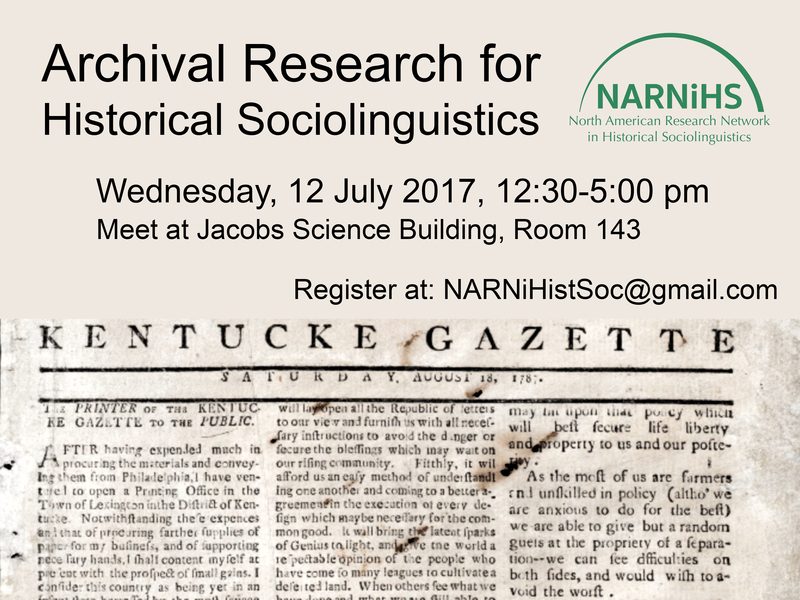 After an introductory discussion of the origin and goals of NARNiHS, participants shared their research interests in historical sociolinguistics and engaged in general discussion about ways for members to become directly involved in the work of NARNiS to promote historical sociolinguistics in North America. In its capacity as a Sister Society of the Linguistics Society of America (LSA) (see above), NARNiHS held its first annual meeting, co-located with the LSA Annual Meeting, at the Sheraton New York Times Square Hotel in New York City. 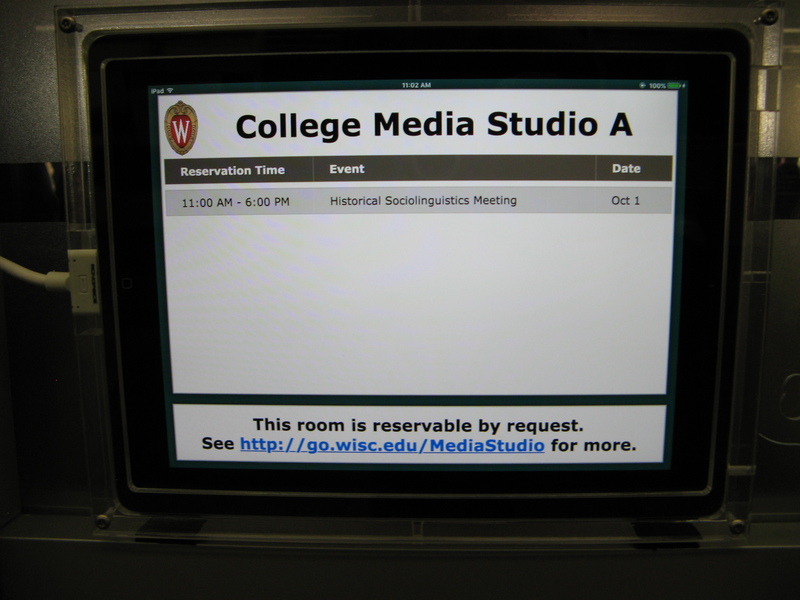 Nine 20-minute papers and seven posters, by participants from five countries, presented cutting edge work in historical sociolinguistics, investigating multiple languages in their socio-historical contexts from medieval to near-present-day. See the NARNiHS 2019 program and NARNiHS in the complete LSA 2019 program. As an initial test of the possibilities for establishing a recurring NARNiHS presence at the long-standing international conference KFLC: The Languages, Literatures, and Cultures Conference (held annually at the University of Kentucky since 1948), Don Tuten (along with Joel Rini) organized a special NARNiHS-sponsored Historical Sociolinguistics panel in the venerable Hispanic Linguistics Division of the conference in April 2018. In April 2019 NARNiHS @ the KFLC debuted as a collaborative conference environment, a “research incubator”, where presenters bring work that is in-progress, exploratory, proof-of-concept, prototyping; and the audience participates in the brainstorming and workshopping of those new ideas. We see NARNiHS @ the KFLC as a place for testing/pushing boundaries; developing new theories, methods, models, tools; seeking feedback from peers willing to engage in productive assessment of fledgling ideas and nascent projects. See the NARNiHS @ the KFLC 2019 program and NARNiHS in the complete KFLC 2019 program.